Mega Man Legends 3 didn't happen. We all know that, and for some the fact that the game never saw the light of day remains a sore point. 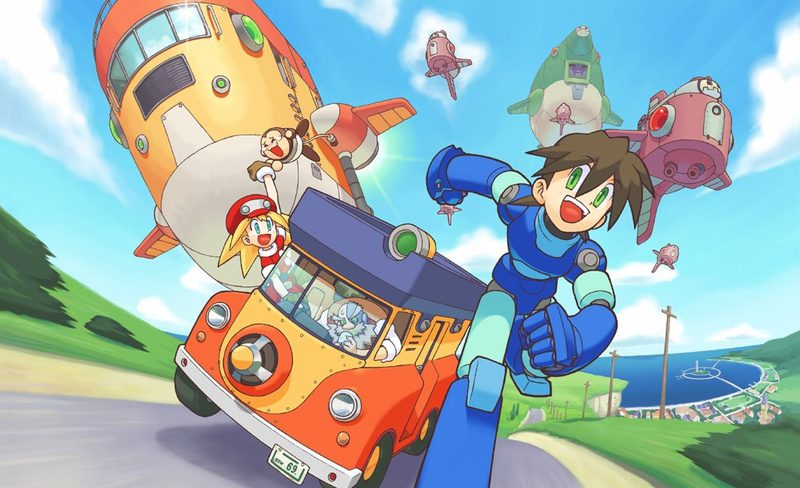 You might assume that the chances of Legends 3 ever being produced are slim to none, but Mega Man creator Keiji Inafune has revealed that he would jump at the opportunity to finish off the project. We all know that's not going to happen, though, as long as Capcom holds the IP. But if they asked me to make that game, I could still gather most of the original team, even right now. Some of them have quit Capcom, some of them are still at Capcom, but I believe that team would be passionate enough to come back together and create that game. So…we'll see what's going to happen. You never know. Let's say that, if we have all seven Dragon Balls right here, right now, and Shen Long comes up and says, 'What's your wish?' My wish would be, give me all the right tools, people, and environment to create Legends 3. Inafune is of course working on Mighty No.9 and Azure Striker Gunvolt at the moment, but it's not beyond the realms of possibility that he and Capcom could come to some agreement. Would you still be keen to play Legends 3 if it did somehow find its way to market? Or has the entire saga left a bad taste in your mouth? Let us know by posting a comment. That is great. Just don't ask your fans to fund it. Capcom dropped it because their idiots, like most publishers. Morons that only go with a sure thing. You can't fight that kind of stupidity, sadly. I loved legends 1 and 2, my favoritt games with the megaman name. Capcom really disappointed me when they canceled legends 3. The chance of legends 3 being revived at this point is slim, but i really hope they do. Did you know why there's no Megaman games? Because Capcom wanted to turn it to an FPS. Capcom and Mega Man is the definition of ambivalence. This is not going to happen it was cancelled 3yrs ago lets just move on. I'd love to see the first two titles and The Misadventures of Tron Bonne on the 3DS, Wii U or PS3 in one way or another. What i've seen from Legends so far looked great and really made me want to play it. And while i'd prefer to play these game before Legends 3 i might still cave in and buy this if it ever became available on the 3DS, Wii U or PS3. Wait for the income of Mighty Nr9 and Gunvolt, buy the rights to MegaMan with this and secure yourself one of the most iconic franchises ever made. i dont see why capcom wouldn't agree to a partnership with Inafune for Legends 3. do you know how the fans would react to Legends 3? They went crazy over Mighty No. 9, they'd be unstoppable with Legends 3!! Nintendo buys Mega Man RIGHT NOW and asks Inafune to work on Legends 3. Wii U Sales Up. I don't think Capcom will cave at least until after the release of Mighty No. 9. If that game succeeds, they won't stand a chance against Comcept. They'll know they have to give in at that point, since no Mega Man game is in development as far as we know. @HappyHappyist Some wounds never fully recover especially if you keep opening it up again and again. Make it happen Capcom and released it exclusively for 3DS or Wii U. This game has been long demanded. LET'S FIND KEIJI INAFUNE ALL THE DRAGON BALLS!!!!! "We all know that's not going to happen, though, as long as Capcom holds the IP." If they didn't do it when Inafune worked for them, no way they are gonna do it now. NINTENDO!!!! GET WITH CAPCOM AND CREATE THE GAME!!! Only if they could at least re-release 1 & 2 in some shape or form. I've just checked Ebay and my jaw hit the floor. Obviously a 2-game 3DS port would rock but I'll accept PSOne Classic digital downloads. If it really happens, then good, but I'm not holding my breath for it. I would pay any price for that game. AH, I'll buy it at a high price! @Lance168 One problem though. How much will they spend on Mega Man? I wish Nintendo would buy Mega Man from Capcom! Oh we'll get MML3 all right, as a coffee mug. Not really news is it though? He still wanted to "make the game a reality" a year ago. It's unfortunate but with Capcom at the wheel of Mega Man its not really going to change anything. At this point I think we'd all be celebrating if they sold off the franchise to someone else. Capcom is dead to me. They are now Crapcom to me. I used to be a HUGE fan of Capcom back in the day too. Sad. @AugustusOxy They go with what they think is a sure thing. (Doesn't seem to turn out like that though when it comes to any of the Western targetted stuff). Aw man, I hope he can finish this game. If they can port it to the Wii U too, that would be awesome. I have a PS4 and a 3DS, but a port towards the Wii U would make me get the console. I want to See Megaman Legends 3 in HD! Welp... time to find the Dragon Balls! @Lance168 My thoughts exactly, Nintendo has definitely got to buy mega man, they give him more love then Capcom has. This would make me verry happy. I never really got into either Legends 1 or 2. the first back on the PS1 left such a bad taste in my mouth. It wasn't the 2D to 3D transition that i expected out of the blue bumber. it was nothing but a 15 minute rental folks! I wanted Legends 3, but I wasn't all that enthusiastic about the new protagonist. How Megaman interacts with Roll and Tron is part of what make Legends Legends. @FX29 That'd make me super mega happy! No offense to Mighty NO.9, but I don't like the new character Beck, or whatever his name is. I'd rather have the good ol' Blue Bomber!!! Honestly, I can see Sakurai becoming interested in working on a new Mega Man game. He can easily make Nintendo buy Mega Man for him! Lol That Dragon Ball bit was great. I'd still play Legends 3. Is this going to happen? Highly doubt it. Talk is cheap. If you can make it happen, just do it. This is just relighting the fire. Please, Inafune, don't talk about wanting to continue working on Legends 3 at a time where you absolutely can't sacrifice any more of your time for other projects. @Lance168 Don't know where you got that from. MegaMan: Maverick Hunter was a proposed idea from Retro Studios, but Capcom rejected. It was never their idea to begin with. The first two Mega Man Legends games were terrible, we really don't need a third one. LET IT GO. @HappyHappyist Morgul blade wounds heal you just become poisoned and turn into a wraith if you don't take the shards out quickly. Capcom is only interested in Mega Man as a 'legends property'. Meaning? You know how, people say 'Sega needs something other than Sonic' (despite the fact they have a steady PC market, Yakuza, Atlus as a subsidary, Shinobi, Alex Kid, Toe Jam and Earl, Jet Grind Radio, Golden Axe, the Shining series, Altered Beast, Shenmue and Streets of Rage) or 'Nintendo needs more than Mario / Zelda / DK' (despite the fact they have F Zero, Metroid, Golden Sun, Star Fox, the everyone-in-one Smash Bros, and 3rd party series that are ALWAYS on Nintendo platforms: Fire Emblem and Sin and Punishment))? These are brands that defy generational convention. As in, it doesn't really matter what system they're on or what dimension they're in, they're part of the brand. Mega Man isn't about going forward, not for Capcom. This is a company who, like Konami, only wants to move towards super HD, super realistic games. The idea of a retro, modern indie game is one lost on Capcom. Konami's own 'Rebirth' stage has passed and we'll likely never see something like that from them again. Really, the only hope we have is the cheaper, digital only scene and without Inafune, Capcom's Mega Man phase has passed. He'll cameo in the Vs Capcom games, the Smash Bros. and you might even see costumes and random appearances in various other Capcom titles. So, because Retro Mega Man is seemingly out and Legends 3 is dead, here's my proposed game: 3rd person action platformer featuring the anime style of the later X's cutscenes and digital world levels based on the Battle Network games. The story: a young boy (or girl), living about 100 years in the future, battles viruses in the digital space using a Mega Man avatar. One day, a powerful virus breaks free (think Smith's escape in the Matrix) and suddenly, the avatars are able to manifest in the real world. I like the idea of levelling your character(s) via either typical battling or being augmented with salvaged parts. Unlike Xenoblade's gem system, you'd be limited to one elemental type, but other stats could be increased to make up for new vulnerabilities. I'm not sure about the title, maybe something like 'Mega Man Battle Network: Escape', 'Mega Man Transition', or 'Mega Man VR'. The VR would be Capcom's answer to the VR craze, to let people know of the crossover appeal between MM and the Battle Network series and to possibly set-up a cleaner transition to a first person MM. To that end, if Capcom did ship off MM to Nintendo (where Inafune could get Legends 3 made), I think Retro could make a genre defining 1st person Mega Man. As an appendix, I don't see Capcom selling off Mega Man. So I think a better bet (suggested by an earlier point) is Nintendo should acquire Treasure. Sega has Atlus and they're letting Atlus work, business as usual. With Treasure on their team, a 2D Metroid, new Star Fox (imagine a top down Star Fox, 15-20$ on the eShop! Or how about a completely remade Star Fox 64 for 30$ on the 3DS?) and even a new Gunstar game would be possible. In addition, Nintendo would have unfettered access to Treasure's entire back catalog. I'd love a new S&P in HD and a 3D take on Radiant Silvergun or Bangai-oh? Really, it'd be a win-win situation for both parties. Treasure's income is laced directly into the big N's considerable cash reserve and Nintendo gains a group of the shoot-em-up genres best minds. With so much 2D gaming experience, Nintendo could once again claim the title of platform king. I still need to play MML2, but MML is a great game. I'm still disappointed MML3 got cancelled. Please make it happen! But finish Mighty number 9 and Gunvolt first! You can't do all at once! Oh my god yes! I want this game so bad. I don't care what has to happen. Let nintendo buy the megaman IP, or all of capcom! I just want megaman legends 3 to be created. I'd buy it, but I'ma be honest here. Legends is not my idea of a Mega Man game. No no no, when I want to play Mega Man, I want a 2D platformer with robot masters and powers, gained abilities, Wiley/Cossack stages (or Sigma or whoever) and a slammin soundtrack. That's Mega man. All that Battle Network, Legends stuff is fine, but it's more of a side dish to me than anything else. Why does everyone thing Nintendo would make Legends 3 even if they could somehow buy Mega Man from Capcom? If anything, they would simply focus on the classic and X series since those are much more popular and would likely sell better than a new Legends game. With that said, I would love to see a company like Retro take a crack at creating a classic Mega Man game with modern technology. Mega Man 11 with Retro's genuis would be nothing short of awesome. @NodesforNoids Have you heard of Maverick Hunter? It was supposed to be a Mega Man FPS trilogy where you play as X in 1 and 2 and then Zero in 3 after X was turned evil. It was canned awhile after Legends 3 got the plug pulled. Wow, almost can't believe Inafune made a Dragon Ball Z reference during an interview. Exactly, I mean we don't even get a new Metroid, Star Fox, or F-zero, but if they were to buy Mega Man we'd surely get Legends, right? Or even worse the Blue Bomber takes a back seat to Nintendo's own big sellers, like everything else that isn't Mario or Zelda. Its not like they're short on platformers or anything after all. Would I still be keen to play Legends? Ah, YEAH!! Probably one of the biggest disappointments of the last couple of years when this got canned. Dude, just make the game already. Stop leaving us hanging. If Capcom continues to ignore the fans and Keiji Inafune, then he should make a spiritual successor to MML3. It might not have the same story or the same characters, but it will be a huge hit, one that will surely put the hurt on Capcom. Keiji Inafune is not pure gold. Yaiba Ninja Gaiden Z is awful. He has always had bad games as well. translation: Keiji Inafune Stills Wants To print money, while capcom wants to loose money. As do I. Even though Mighty No. 9 pays great homage to Classic Mega Man, however Beck can never replace an iconic character like the blue bomber.